I have been perusing the members area plant profiles and I came across the article on C. Barbellata and thought how beautiful and unusual it was. I have tried to source one, so far without success and wondered whether anyone knew of a nursery that stocked it (preferably that does mail order). I've tried Hythe-Alpines but they've sold their last one showing any sign of life. Any help would be much appreciated. Not sure if Kevock still have it but they did advertise it in their 2007-2008 online catalogue. Thanks. I had tried them. They do have one that they think is Barbellata but cannot confirm it - presumably it's never flowered. However Hythe-Alpines got back to me today and some of their Barbellata's that they thought had died are now (last few days) showing strong signs of growth, so I promptly ordered one! It seems very late in producing shoots - is this normal? Yes, this is rather late but then everything this year seems to be late. Mine produced only four flowers this year which is a lot less than usual. A lot of the top growth got killed off over winter but it is currently throwing out lots of new stems. Interestingly enough Hythe Alpines recommend you feed this one with ericaceous plant food. Really nice photo of the flower. Is it planted outside - if so what aspect and soil? What do you feed it with? Have you risked feeding it with the ericacious plant food? Magnus and Christopher Grey-Wilson include it in section Bebaeanthera along with C. Japonica obvalata, which is interesting as I have one ready to plant. Are there many similarities between C.Japonica and C. Barbellata in the sense that should they be treated similarly, soilwise, aspectwise, feedingwise etc? My C.barbellata is in a container (a large one of about 20 litres) and I have fed it with both normal and ericaceous feed but have not noticed much difference. This year it seems to be growing very well and might be due to the ericaceous feed I gave it late last year but I would not like to say this was the real reason. When you see this plant in real life the stems are so thin you will wonder how on earth it would ever pull through an english winter without dying back to ground level (with the loss of next years flowers). I intend to layer it this year and do a few experiments with it planted in various places around the garden. My C.japonica var. obvallata passed away this year despite being in a cold greenhouse in a large container. A bit stumped why this has occurred as it was one of my favourite plants with flowers like few others. 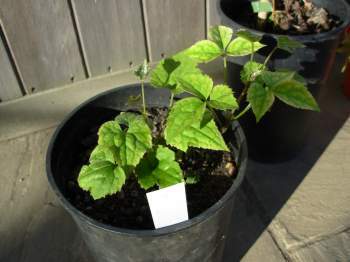 C.japonica survives without problem in the garden but all the outdoor examples of var. obvallata I had seen had perished, so I had decided to take a more cautionary approach with this variant. Perhaps if I had just planted it in the ground instead of trying to wrap it in clover I might have seen those unusual flowers again this year. Looks Like I might need to make another trip to Crug Farm - shame it is so far out of the way. When planting in large containers I tend to mix in john inness no,3 with an equal measure of compost, some perlite and slow to release fertiliser. It's interesting you say the stems are so thin on your C. Barbellata because my C.Japonica var Obvallata stems were also extremely thin when I bought the plant from Crug Farm last October. I pruned the plant when I got it because it didn't look in great shape and I hoped cutting it back would strengthen it. I also fed it a couple of times over winter with some growmore plant food. I kept it in my unheated greenhouse over winter (it's a cedar wood greenhouse and has no draughts). At about the end of January/beginning of February it started developing buds and these started sending out shoots in March. It is now about 14" high (from base of its pot) and growing really fast with very strong stems. I will be planting it out in the next week. I've had a big planting session this weekend and planted my Koriana var Lutea, a napaulensis, a confusa, an acuminata subsp sikkimensis, and a chinnensis (all bought from Crug Farm last October). 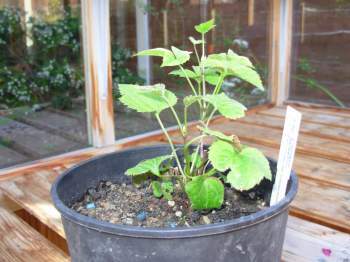 The only plant I'm having a problem with is an apifolia which I bought from Crug Farm a couple of weeks ago. It has one very weedy stem and every time a shoot develops it dies back . 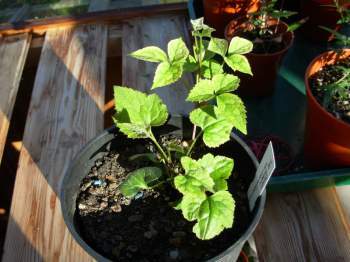 I have got so fed up with it doing this that I repotted it today using a mixture of peat free soil-less compost made from composted bark, grit and some sifted garden soil. As it grows in forests I thought I would try and slightly replicate the soil conditions. Maybe it will do the trick. Thought I'd post a picture of how my clematis Barbellata is getting on. I repotted it about 2 weeks ago because it wasn't putting on much growth, but it seems to be picking up now. Sorry to post to an old thread, but I just found this discussion while searching for "Clematis Barbellata," which I also have been trying to source for quite a while. 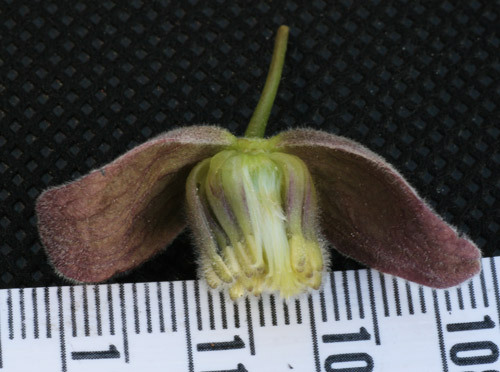 Does anybody know where I could obtain this clematis (either plant or seed). I'm living in the USA. I have tried to locate the plant in Holland because the plant was in our country but now no more. I hope that you will find one soon and will let us know what the plant looks like! My "Barbellata" died, but I suspect it wasn't the real McCoy. The search goes on!